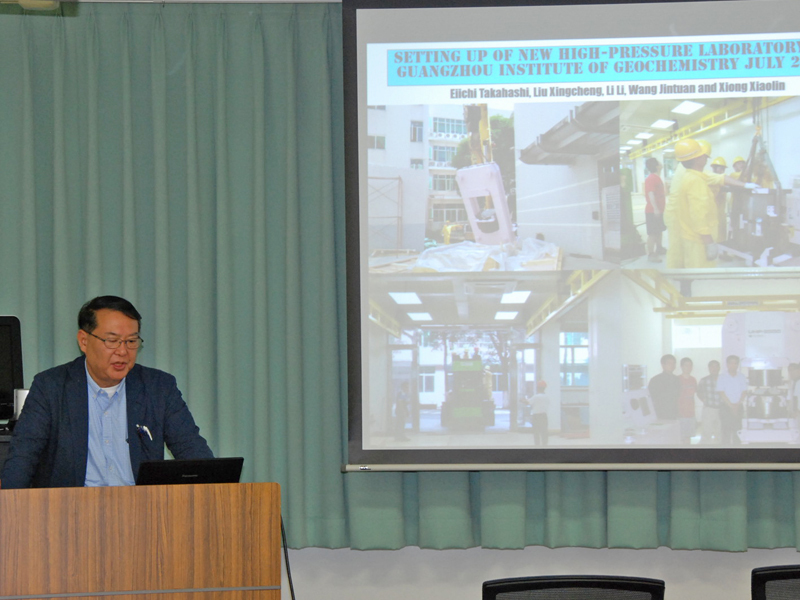 講義の概要 High-pressure melting experiments were carried out under dry and hydrous conditions with layered eclogite/peridotite starting materials. Spinel lherzolite KLB-1 (Takahashi 1986) was employed as peridotite component in this study. Two basalt components were used as recycled crust component: 1) Columbia River basalt (CRB72-180, Takahashi et al., 1998) which is relatively enriched in K, Ti and LREE (K2O≈1wt%, TiO2=3.15wt%), N-type MORB (NAM-7, Yasuda et al., 1994). Melts formed by reactive melting of dry eclogite and peridotite changes dramatically in the temperature range across the solidus of peridotite KLB-1 from basalt (below dry solidus) to picrite (20-40C above dry solidus). Basaltic melts are not saturated with olivine both at 2.85 and 5 GPa and therefore they are separated by peridotite matrix by Opx film. Chemical reaction between the basalt melt and the peridotite matrix proceeds only slowly by solid-diffusion across the Opx film. In hydrous experiments, solidus of peridotite decreases significantly and therefore the reaction between hydrous melt and the partially molten peridotite matrix proceeds at temperatures below peridotite dry solidus. Based on present experiments, we propose that potential temperature of the Hawaii plume may be only 100-150C above that of normal asthenosphere. Tholeiite magma in the shield building stage may be formed slightly under hydrous condition near the dry solidus of peridotite (1450-1500C at about 3 GPa). Chemical distinction between Hawaiian shields (e.g., Mauna Loa and Kilauea) might correspond with difference in mixing ratio or degree of the chemical reaction between the recycled eclogite blocks and the ambient peridotite. New hypothesis for the origin of alkali-acidic magma (hawaiite, trachyte, phonolite) which occur soon after the main shield stage is proposed based on melting of eclogite at pressures 3-5 GPa.